Two years ago, July 2015, I imaged this object with a 130mm refractor and decided to go back to it again, this time with my 10” reflector to increase the image scale and see if I could get a bit more resolution. 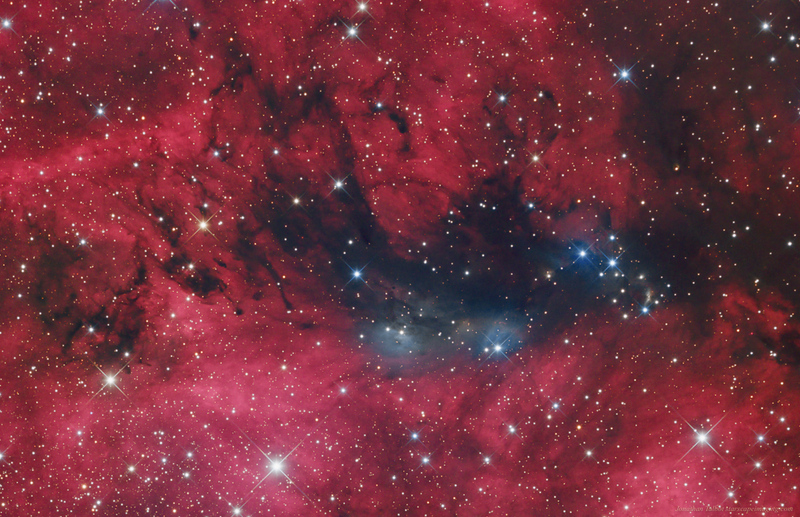 NGC 6914 is a reflection nebula in the constellation Cygnus so its high in the sky during the summer months. It lies approximately 6000 light years distant according to most sources. Many hot stars are in this area as part of the Cygnus OB2 association and the ultraviolet light from these stars lights up the hydrogen gas causing it to glow red and other hot stars also cause the dust to glow bluish. This image is comprised of 24hrs of exposure time.